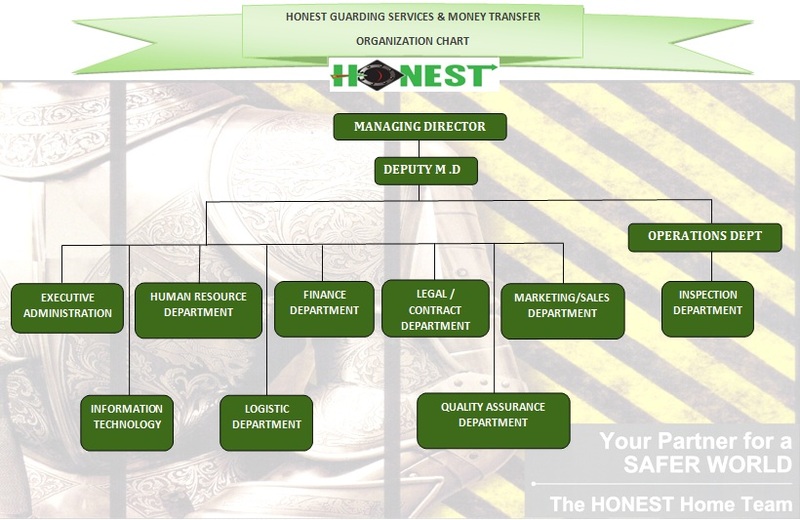 We are in Honest Security Service & Money Transfer before we receive any security task inside any projects we answer the questions that customers are looking for an answers to the standards and specifications that are available in our organizational structure of the company and we would like here to clarify the questions and answers. We hope that our customer find clear answers to all their questions. Thank you for choosing Honest Security Service & Money Transfer. Security Experience Experience certificate – Emergency Procedures – Sense of Alertness – Sense of Security – Safety practices- preferably from military services and highly distinct. Visual Aspects The appearance of the guard is an indication of his diligence. Our guards appears professional and in proper uniform. And the best security guards are those that are healthy, nimble and physically reliable and enable to defend himself and the client if and when necessary. Fluent in English An excellent security guard must be able to communicate well, not just with the client but with other people the client works or is involved with on a day- to-day basis. Why our company different from the more local reputable companies? Sense of security – vigilance in general- the speed of disposition of emergency situations- decent appearance. The work style of the management team starts from the planning of the director with the help of our Marketing team; we study our target clients and divided them based on their needs and requirements. Is to provide competitive quotations after a thorough study of what each client needs and requirements of both securities provide manpower, equipment and technical tools used within the site. Security gaps and finds the most suitable solutions to its security and style selection working and determined. is preparing a comprehensive training plan for all working active levels and be at frequent intervals and be within the site and have the plan on a comprehensive approach to security instructions sustainable as it should be the plan flexible to accommodate the introduction of the new platform which includes the most important variables of security, as well as what any other instructions to the client or to confront contingency plans. The philosophy of the company is that we are working as partners for the client in all aspects of work and we do see only to get an annual contract, but extends our view that the adoption of the client company is also to adopt a holistic and invested part of the economic and financial welfare. The company’s vision is not limited only to provide security services but also to develop, modernize, innovate and provide security solutions for sustainable security gaps. The Company’s approach depends on the real investment that should be in our dependence on human resources and training courses. The administration of the company in the form of working administrative and executive work in accordance with the system work systematically through the expansion within the market at a rapid pace and audited so that the aim of these steps to accommodate all segments and sectors of the customers who are in the market through targeted to provide services in line with their requirements and introduction at the highest level of satisfaction of the customers in parallel with the Proposals competitive prices check them financial return desired without compromising the quality of service and overall professionalism. The definition of a good employee with all rights and duties and what is the constitution of the company detailed. The appointment of the employee to an appropriate place according to qualifications and experience and the extent of compliance with the duties and functions of the work assigned to him. A good assessment of the employee and upgrading through courses eligible and appropriate to his abilities, which reflects its efficiency positive. Appreciation of the moral and material positive and constant stimulation and promotion of the positions of the supreme employee excellence. Approach of reward and punishment, and constantly modify the mistakes which ensure the company’s continuous retention of skilled and qualified staff. The company, every month, by a running process, the client may nominate a deserving security officer who deserves to be given a reward of moral, financial and a certificate. There is an annual incentive proficiency obtained by ideal individual who receives this recognition for three consecutive times which is equivalent to a one month salary. And for being a disbursed proficiency an immediate incentive is given to those who contribute to the prevention of danger or accident that happens almost immediately within the site to be up to run the company from the customer’s speech so personally or contribute to the site to get acclaim or promise from various parties. We usually make recreational things for the guards such as forming teams for sports to refresh their minds and body from work. After their duties or in any suitable time for the guards, we set a simple gathering in beaches, go swimming and eat together to have a team building. Our labour camp is currently very excellent and very comfortable wherein according to the actual area room can accommodate more than eight security officers, but as per the interest of the directors the allowable individuals to occupy the room are only six persons. The camp also provides all the amenities and means of communication such as internet connection and the company assumes the monthly rental. You can even find a supermarket inside the camp for the extra needs of the guards. And also, each room is equipped with automatic washing machine and flat iron for their uniforms. We give one day off to each of guards every week with a respective reliever to take charge of the site. It is our company policy that the guard in day off is not allowed to have duty even to other location because this is the only time for them to take rest. We absolutely provide 2 sets of uniform every three months to maintain the good grooming and hygiene of all our security officers. We place values to our clients so we give them what can satisfy them. We bring our trusted guards are from a variety of nationalities which are undergone the necessary training and with experienced that will help them obtain important skills and knowledge and make them perform their job well. Termination (with lawful reason) depends on the weight of the violation of the security guard. 1 Note putting on the security card issued by the Competent Authority when on duty. 3 Not taking enough care of one’s clothes and outer appearance. 4 Not informing the Company of losing the Competent Authority card within 24 hours. 6 The Security Supervisor trainer not obeying the orders of the follow-up team and not cooperating with them or with policemen. 7 Leaving the place of work while on duty for any reason whatsoever. 8 Not wearing all the determined uniform accessories. 9 Giving the follow-up team any wrong information when searching for one. 10 Behaving in a bad manner towards others while on duty. 11 The security guard doing a job other than the job assigned. 12 The security guard abusing their position for their own interest. The subject penalties are acknowledged by the guards. The security apparatus within the facility to raise efficiency the training and skills of security for all cadres of security and this comes to develop a plan to train and rehabilitate these cadres. Will be the work of editorial models for tests in different ways at the end of each training session to ascertain the extent accommodate students of information security and the tasks and duties for all service centers. Is a success in the written tests for each course is a prerequisite for promotion to the top job within the site and within the company. Will be given a certificate stating that students receiving training course within the site to be saved file security officer within the site and the company. Will be the success of the work report at the end of each role includes assessment of the trainees, as well as highlighting the strengths and weaknesses and to avoid comments that appeared to ensure the continued implementation of the programs of the highest level of cycle.